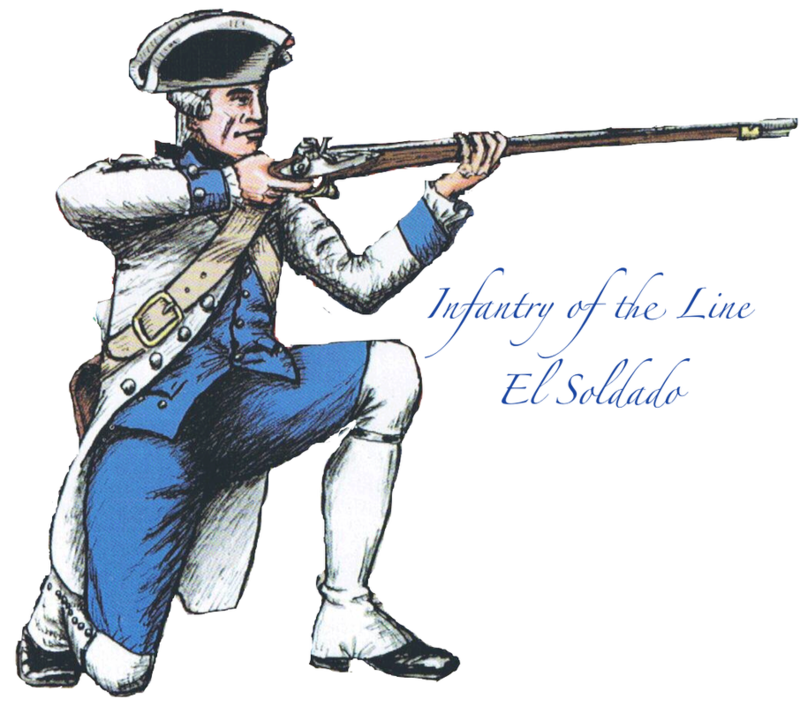 Infantry of the Line are the soldiers who provide the backbone of the battle and fight in linear formations. White linen, canvas duck or summer-weight wool with royal blue lining, collar, cuff, and turnbacks. The Regimental coat is single breasted with ten one-inch flat faced pewter buttons running down the right side and no buttons on the left side. Three buttons are attached to each of the coat's two pockets and two more sit at about waist level above the tails. Royal blue linen waistcoat and breeches with pewter buttons. 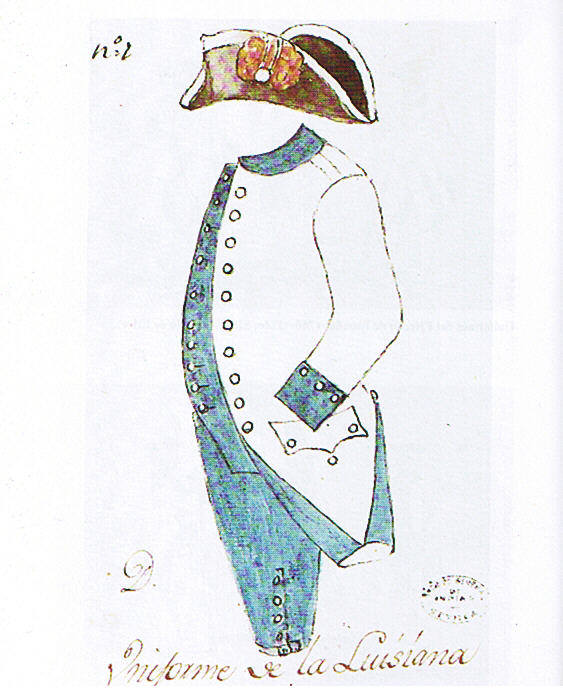 White linen or cotton waistcoat and breeches may also be worn. A long sleeved white linen waistcoat, know as a "la chupa" can be worn. La chupa is closed by a single row of half-inch pewter buttons. Three more buttons are sewn by each pocket and one at the opening of each sleeve. White linen cravats were worn around the neck instead of a neck-stock, but a white linen or cotton neck-stock may be worn. A black cocked hat, made of stiffened black felt and edged with ¾" white tape. The hat has a red satin bow shaped cockade fixed on the left side of the front corner by a white loop. A flint lock musket, bayonet, bayonet scabbard (leather sheath for the bayonet), flints and musket tools. Genadiers provide the shock troops on the field. A tall black fur cap with a long, flat 'bag' falling behind. 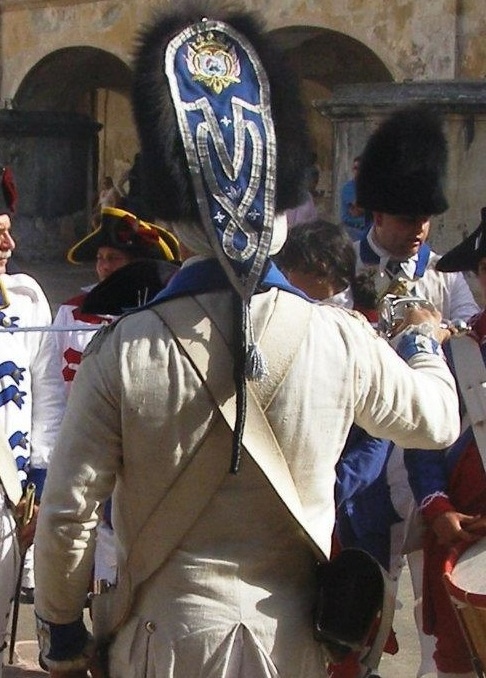 The 'bag' is royal blue and highly decorated with an embroidered, colored crest of the arms Spanish Louisiana. Officers and sergeants caps are also trimmed with silver. 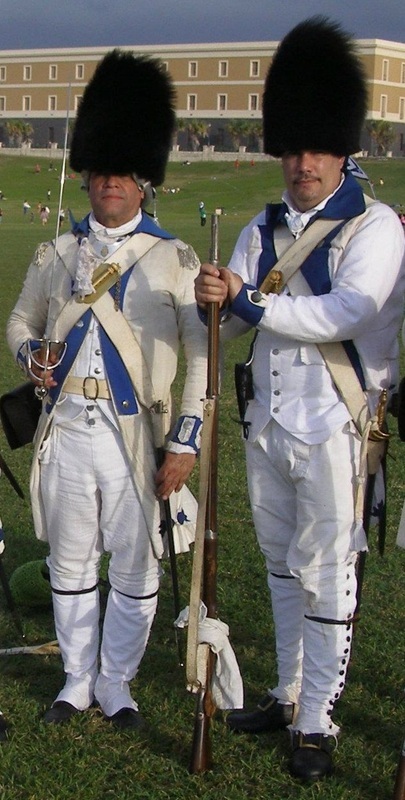 Same accessories as Infantry of the Line, except for the hat. A flint lock musket with bayonet, bayonet scabbard (leather sheath for the bayonet), flints and musket tools.